You're not shortlisted for 8 gongs at the International Design & Architecture Awards if you don't have HUGE talent! Thank goodness for the ability to spy on your friends on Instagram! Without the 'tagged pictures' function, I probably wouldn't have found Brian and Chow Mein. Yes, a quick Google of top interior designers in the UK would have recommended Brian's services (Designed By Woulfe is his company name), but it might take a while to actually find out that Brian has a rather gorgeous sidekick. It figures really. 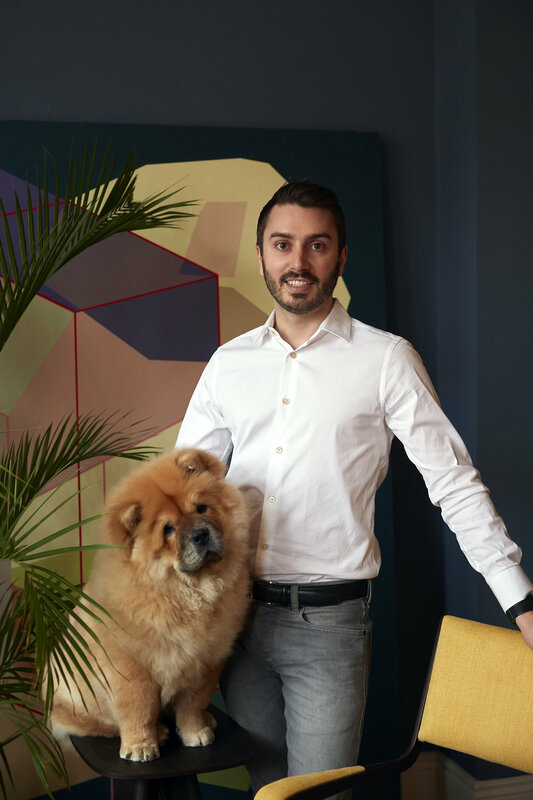 A top Interior Designer who has such magnificent taste in everything from sofas to shelves to wallpaper, someone who has an exquisite eye for detail and an innate ability to chose pieces that look so natural next to each, chooses a dog like Chow Mein. Just look at these two together! So well matched. In a recent interview, Brian said his dream job would be to take on the White House because of the "endless dreary, muted and dated interiors." I think Trump better move over! From the look of Brian's home, the White House would possibly be a slightly better place to be in. Actually, I'm not even sure Brian and Chow could save that place right now! Anyway, take a look at some more pictures below, and hear from Brian too. On life with Chow: She is the ultimate discerning client - she only sits on the chairs that she likes! She has great taste and some may say she’s a style icon! My life with her involves lots of cuddles but lots of hoovering too! I can’t live without a Dyson. In fact, maybe she should apply for a job as a Dyson model?! On work: It all happened completely by accident. It was both unplanned and unexpected. The journey could be a book or a movie one day. I am a bit of a perfectionist, (well, more than a bit!) and have been since I was a child. I notice when the placement of a painting on the wall or a book on the table isn’t quite right. I spot imperfections in the plasterwork, cushions that are not plumped or colours that are slightly off etc.… and so, interior design seemed like the right fit! And that’s really how Designed by Woulfe came to be. On a career plan B: I often dreamt of being a doctor. Maybe in the next life. Though I don’t think I’d have been able to take Chow Mein to work with me in the same way I can as an Interior Designer. On interior design TV shows: Dull, dull and more dull! They need a shake-up. Dream house would be the White House but perhaps without its current occupier. Be patient and the good things will happen. On one thing he loves about Chow: She winks! Seriously, it’s the cutest thing. When you catch eye contact with her she winks ;-) I can be having the most intense day at my desk but when I look over at her and catch her wink it puts a smile back on my face! The best piece of advice: There’s nothing that can’t be solved with a glass of rose and a cuddle with your dog! A walk along South Bank and over Waterloo Bridge. The view of London’s ever changing skyline is incredible. I’m amazed how much it has changed in 10 years. Colombia Road Flower Market for colour inspirations. A good Sunday roast in my local with friends. One thing people should know about him: I used to be a concert pianist and some of the videos I’ve made for my projects feature recordings I’ve made. Naturally Chow Mein has made an appearance in some of the videos also.